What do you make of ANTHEM's launch trailer, then? Clocking in at around one minute long, it's not the lengthiest trailer in the world but it is well made, and it did manage to spark just a little extra excitement in us. That said, it's not quite launch for PS4 players, is it? There's some early access nonsense happening on PC and to an extent, Xbox, but the game's not out on Sony's system for another two weeks or so. Are you hyped for ANTHEM? Hop in your Javelin and go soaring about the comments section below. After that downgrade, I won't put a lot of faith in this game. I'll probably wait, see what Destiny 3 is capable of. It's all a bit naff isn't it? A bit like the Pacific Rim 2 of video games. The music was an awesome remix, but man the story of this game bores me to tears. It just seems so generic. Looks amazing better than that garbage Division 2 that is. In my eyes, just another bland live service to throw on to the pile. I’m curious about the scores Anthem will receive. I enjoyed the demo. I will be getting the game. Especially when I can get it for $40. I'm looking forward to it but more excited for The Div 2. I hope this flops. I'm not a fan of EA. I think it will sell well, it's a multiplatform title after all. But I don't think it's going to be the next big thing like EA is hoping for. It's too bad that they most likely won't release the monetization scheme till after all the reviews come out. We really need to hold the reviewers to update their reviews when it is released. Interesting use of Ozzy's Crazy Train. Maybe I'm a bit jaded, but I played the open demo for Anthem and quit after the first mission. That's slightly better than the Division 2, though. I had my first encounter and quit. More of the same. I'm still playing RDR2 and still have the last chapter of God of War and all of Horizon and Persona 5. Then there's Gravity Rush 1 & 2 in my library. And my third playthrough of Nier. I'm good. Bacon and eggs (thank you next). @ellsworth004 Please do not put words in my mouth. Never did I say I hope people lose their jobs, but I do hope this game doesn’t do well because I dislike EA and their predatory practices when it comes to microtransactions. There are plenty of times a game sells well below expectations and it does not result in layoffs, so it’s not a given just because a game sells poorly. And I think I made it clear in my original comment that it is EA, the publisher, that I dislike. I have nothing against the developers whatsoever. At the end of the day like I said before, I think it will sell well. Most AAA multiplatform titles do, and I don’t think the developers have much to worry about. Doesn’t mean I can’t root against EA. Trailer was a bit bland but looking forward to the game and how it evolves over time. Hope it does well! @deepspace5d @ellsworth004 I don’t necessarily wish this to flop. However, I do wish EA would learn from their mistakes and become a better company moving forward. There is a lot of talent currently being utilised to develop games for EA. But they should be given more creative freedom and their work should not be restricted by the financial greed of EA on release. EA’s actions (and some others) hurt the industry as a whole. We need to be better than that. Am I the only one who snickered when he said "Feel the power of your javelin"? This is not a Bioware game. It is a EA game. Make no mistake about it. I hate EA. No chance in hell I am buying this crap. @Kienda well said and I agree. the music's the best part of the trailer. If the game was relatively linear, story focused game then this trailer could be accurate. However since it's focused on loot and grinding there's no way it will resemble the trailer which is a shame. @deepspace5d im not trying to put words in ur mouth. Just saying, Anthem fails EA will be fine. Devs maybe not so much.
" it's a no from me dawg". Can't wait for Metro Exodus..
Am I missing something here? 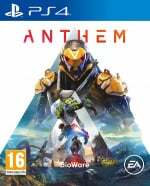 When was Anthem running on consoles with the graphics you saw at E3? So how has there been a downgrade? People really need to understand if the graphics at E3 are to good to be true, that's because they are. Because it's a highly polished section of the game running on a high end PC. @RedMageLanakyn shouldn't they released it AFTER the Anthem first week sales at least?